Dont forget March 15, and what happened 44 BC. The founder of the Roman Republic, Julius Caesar was assassinated and killed by members of the Roman Senate. It is the worlds most famous political murders. The problem was that they didn`t know what to do after Caesars death, so they went from a republican system of government and became an empire. This is actual today. The democracy is under attack. Caesar was assassinated by a group of rebellious senators, and a new civil war broke out. The constitutional government of the Republic was never fully restored, and the Roman Empire began. Rome finally became an empire at the end of the 1th century BC. British historian Edward Gibbon argued in The History of the Decline and Fall of the Roman Empire» (1776) that the Romans had become decadent, they had lost civic virtue. Glen W. Bowersock has remarked; “We have been obsessed with the fall: it has been valued as an archetype for every perceived decline, and, hence, as a symbol for our own fears.” It remains one of the greatest historical questions, and has a tradition rich in scholarly interest. 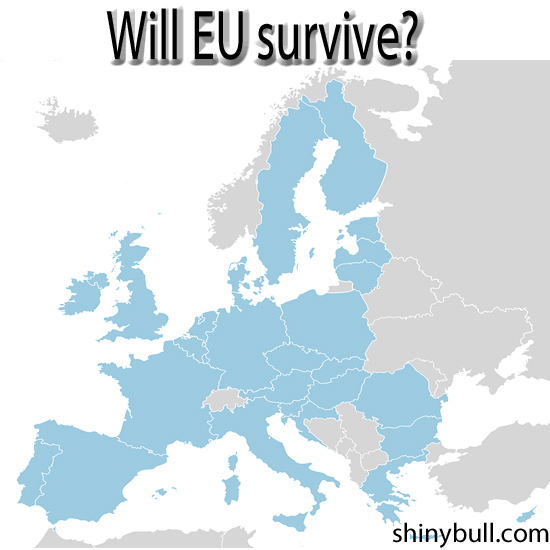 Europe has since the fall of Rome been, not only Euro Zone, but Danger Zone. Are you able to count all the wars in Europe since the fall of Rome? I wrote about the Revolution of 1848 on May 6th last year. We now see many similarities in Europe today. The Revolution of 1848 was also known as the Spring of Nations or Springtime of the Peoples. It was a series of political upheavals throughout Europe in 1848. It remains the most widespread revolutionary wave in European history. The revolution was essentially democratic in nature, with the aim of removing the old feudal structure and creating independent national states. Over 50 countries were affected, and important factors were widespread dissatisfaction with political leadership and the upspring of nationalism to name a few. Now, it is 2017, and many of the same things going on. Political turmoil, Populism and Nationalism. Britain voted to leave the European Union last summer, and Netherland can be the next country to follow. But how? The blond populist Geert Wilders must win the election in Netherland. He is the anti-Islam leader of the Dutch far-right Party for Freedom (PVV) and he is riding high on a wave of populism. Geert Wilders has pledged to close the Netherlands’ borders, shut down mosques and leave the euro and EU if he gets into power. Wilder`s problem is that no one is willing to form a coalition with him, and that will result in a political mess after the election. There are very few, if any parties, that will go into Parliament with him. A triumph for Wilders would emboden French voters to back far-right Presidential candidate Marine Le Penn in elections beginning next month. Le Penn will also withdraw France from the Eurozone, and that would be a big threat to the euro. Latest polls tell us that Mark Rutte will win and Wilders will get about 19 out of 150 seats in Netherland. In France, Le Penn leads the first poll, but she is widely expected to lose in the second round. We are living in a critical moment right now.